How do I test my home's smoke alarm? The increased risk of fires during winter means we need to be extra vigilant in our home fire safety practices and fully the utilise the protection systems already on hand, such as your home's smoke alarms. Electro Systems electricians and the Queensland Fire and Rescue Service recommends that you test the smoke alarms in your home at least once a month. 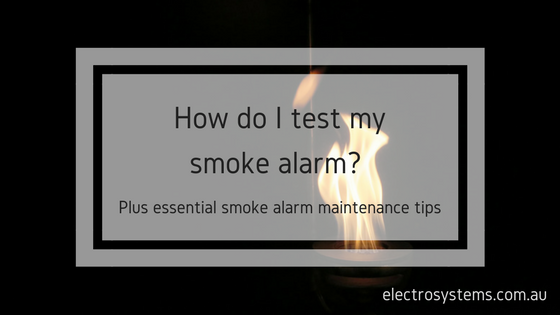 How do I test my smoke alarm? Clean the smoke alarm with a long handled broom or the brush attachment on your vacuum cleaner to remove dust, cobwebs, and insect debris all of which can interfere with the efficient functioning of the alarm. Gently depress the test button. The alarm should emit a loud beeping noise. 9-volt battery powered alarm - replace the alarm batteries and test again. If the beeping is still quiet or inconsistent once the battery has been changed replace the whole smoke alarm. 10-year lithium battery alarm - replace the alarm. hardwired smoke alarm - ask your electrician to check and repair or replace the alarm. Carry out the smoke alarm testing at least once a month. If the alarm is making a slow warning beep at any time throughout the year this usually indicates that the battery needs replacing. Change the batteries if you haven't done so this year. A two pack of 9-volt batteries costs around $8.00 to $10.00 which is a small price to pay for the protection the smoke alarms offer. If the alarm is more than 10 years old it needs to be replaced. In line with the new Queensland smoke alarm legislation, all new smoke alarms must be photoelectric type alarms. This year marks 20 years since new and renovated homes were required to be fitted with a smoke alarm in QLD. If your home's alarms have not been updated since then they potentially will not activate in the event of a fire. Other than routine testing any maintenance or repairs needed on mains powered smoke alarms must be carried out by a licenced electrician. If you're worried about the effectiveness of your smoke alarm or whether it needs replacing contact your local electrician for a professional smoke alarm service. Don't put off testing your smoke alarms, the safety of your family could depend on that tiny appliance tomorrow. Safety Switches, Surge Diverters and Circuit Breakers. What's the difference ? Are the power points in your home suffering from overload? Get started. Get a quote today, from us. Electro Systems are Industrial electrical contractors located at Brendale in the northern suburbs of Brisbane. The company was incorporated in 1990 and has been operating since 1981. Electro Systems provide specialist electrical, PLC, and instrumentation systems in addition to general industrial, electrical installation, and maintenance. Copyright © 2018 Electro Systems. All rights reserved.